This 2nd edition of this best-selling introductory and student-friendly text provides an engaging introduction to all aspects of politics and policy in the European Union. 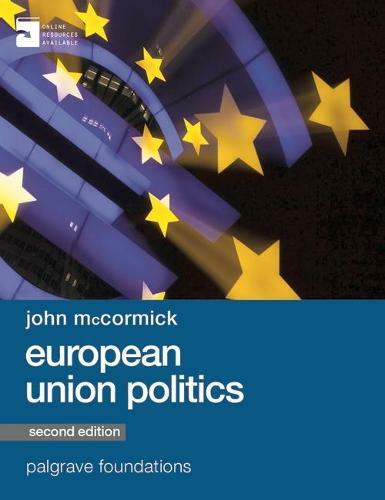 Esteemed textbook author John McCormick introduces the unique nature of EU politics, whilst analysing the Union's impact upon the meaning of Europe and the lives of Europeans. This second edition has been updated throughout - taking account of the 2014 European Parliament elections and changes to key roles in the EU - and has additional coverage of theoretical approaches used to study the EU that will encourage students towards a more sophisticated understanding of how and why the EU has become what it is today, of its strengths and weaknesses and of the on-going crisis in the Eurozone. McCormick has designed this textbook to be accessible to students of all backgrounds and abilities, to act as a companion throughout their studies. Breakdowns of key concepts and debates, numerous case studies, chapter summaries, photos, and more are all included to aid learning. This has all been complimented by a companion website, full of self-test Q & A's, updated material, and lecturer resources to aid teaching and learning, making this text a true essential for all those teaching and studying the EU.